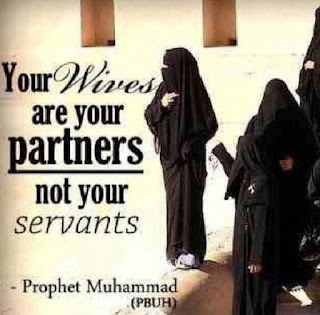 The Holy Qur’an and the Traditions of the Prophet (Hadith or Sunnah) are the sources from which every Muslim woman derives her rights and duties. Today people think that women are liberated in the West and that the women’s liberation movement began in the 20th century. Actually, the women’s liberation movement was not begun by women, but was revealed by Almighty God in the 7th century to Prophet Muhammad (pbuh). Islam, fourteen centuries ago, made women equally accountable to God in glorifying and worshiping Him - setting no limits on her moral progress. Also, Islam established a woman’s equality in her humanity with men. Since men and women both came from the same essence, they are equal in their humanity. Neither gender can be superior because it would be a contradiction of equality. The Muslim woman was given a role, duties and rights 1400 years ago that most women do not enjoy today, even in the West. These are from God and are designed to keep balance in society. What may seem unjust or missing in one place is compensated for or explained in another place. Islam is a complete way of life. With regard to education, both women and men have the same rights and obligations. 1) A man came to the Prophet and said, ‘O Messenger of God! Who among the people is the most worthy of my good companionship? The Prophet said: Your mother. The man said, ‘Then who?' The Prophet said: Then your mother. The man further asked, ‘Then who?' The Prophet said: Then your mother. The man asked again, ‘Then who?' The Prophet said: Then your father. (Bukhari, Muslim). 2) Abu Usaid Saidi said: We were once sitting with Rasulullah when a man from the tribe of Salmah came and said to him: O Messenger of Allah! do my parents have rights over me even after they have died? And Rasulullah said: Yes. You must pray to Allah to bless them with His Forgiveness and Mercy, fulfill the promises they made to anyone, and respect their relations and their friends (Abu Dawud and Ibn Majah). 3) It is narrated by Asma bint Abu Bakr that during the treaty of Hudaibiyah, her mother, who was then pagan, came to see her from Makkah. Asma informed the Messenger of Allah of her arrival and also that she needed help. He said: Be good to your mother (Bukhari, Muslim).